Melrose, in black and white stripes, enjoyed a fine win after the festive season break. 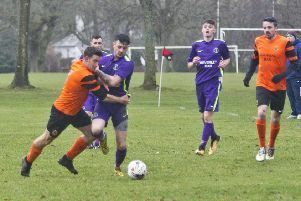 Melrose returned to action after an extended winter break in Sunday’s SYFA South East Division League Three fixture. The home side, playing in black and white, took the lead when B. Adams held off the attentions of the last defender to place the ball past the advancing ‘keeper. Early in the second half, an L. Mckinlay free kick found C. King and the net rippled with his glancing header. Moments later, King scored again after good play on the right from Maclean. P. Billet showed great skill to ghost past several defenders on the left flank to supply Maclean, who netted with confidence. The always competitive Midlothian side pulled a goal back with a fine strike from distance. The final say, however, lay with the boot of R. Maclean, who drilled the ball into the roof of the net from 25 yards. 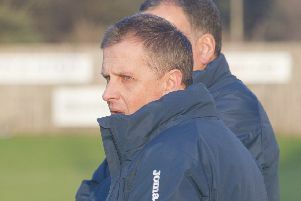 The result saw Melrose advance to second place in League Three. The free-scoring Borders side now face the undefeated Tranent Colts on Sunday.